After 20 years of research, clinical and field trials VitaFlora Liquid Fertilizer & Soil Conditioner was introduced onto the market of Australia 15 years ago causing a revolution in plant nutrition. Through effective use of ALL available nutrients (Applied in VitaFlora and already existing in soil) VitaFlora minimizes leaching loss thus reducing environmental damage. VitaFlora not only stimulates development of the root system, growth of the plant, flowering and fruiting but also balances the pH of the water applied to the root zone or foliage of the plant, which further promotes the availability and uptake of ALL nutrientsrequired by the plant. During the process, complex chemical reactions take place which result in a product that automatically maintains pH at a range between 5.5 and 6.5 value. This is quite a unique feature and today there is no such propriety made completefertilizer brand that yields this characteristic. But what’s more is that VitaFlora may be applied at extremely high EC levels without any harm to the plants. This is another unique feature of the product. The nutrient salts are buffered in solution or in the soil and are released controlled to the plants as and when needed by them. The nutrients will not be leached which is of significant environmental importance. Less nutrients are needed and because of the possibility of high EC applications this is of significant importance for fruit, grapevines and vegetable growers who require a high EC level to enhance taste and sugar content. Smart Technology increases growth by up to 35%. Acts as a liquid controlled release fertilizer. Is contained in one solution instead of the present A and B mixes, eliminating the need for intricate management. Is very concentrated and highly soluble, leaves no precipitation thus no drip blockage. 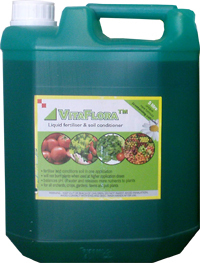 Can be used as a pre-germination solution causing plants to emerge 1 day sooner than other fertilizers. The product is revolutionary fertilizer and is in fact a unique and balanced plant food stimulating root system development, growth, flowering and fruiting. More importantly it balances the pH level in the water applied to the root zone or foliage of the plant which further promotes the availability and uptake of all nutrients required by the plant. The greatest problem of plant nutrition in horticulture, be it in hydroponics, peat substrates or in soil, s pH control. A near neutral pH renders plants more resistant to pests and diseases and promotes better overall performance. Proper pH control is especially beneficial for situations where natural conditions are not optimal. When added to water with a high pH value (up to 7.5-8) the pH of the water will automatically buffer back to 5.5 to 6.5, the optimum value at which plants can best take up nutrients applied to the root zone and foliage. This equally occurs when pH is low. Other forms of organic nutrients which may not otherwise be available because of too low or too high pH values are also buffered and made available. Learn more about the main elements in VitaFlora. 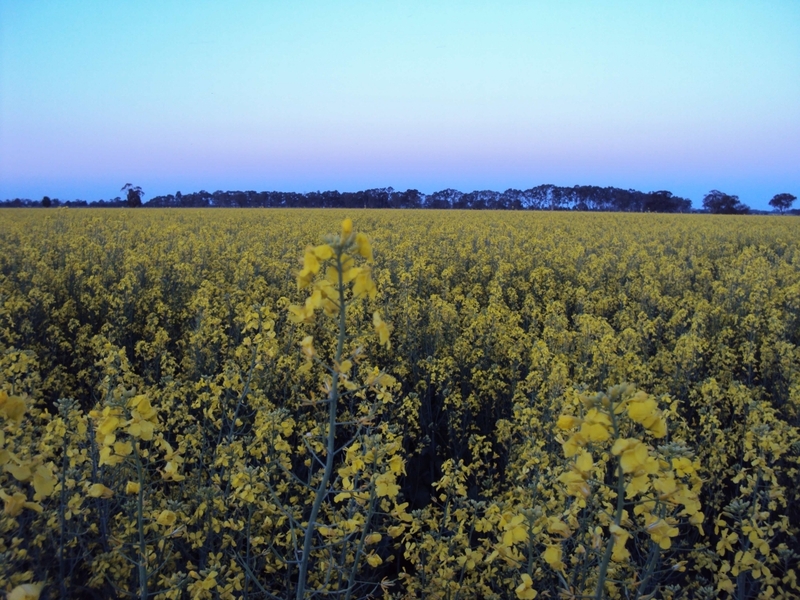 Canola. Trial with Herbagreen and VitaFlora. Victoria. The product is best utilized when applied to both root system and foliage of the plant. This combined use promotes synergy between the rhizo- and phylosphere, ensuring all physiological processes in the plant are well balanced. When taken up by the plant in osmosis the products special organic compounds automatically increase the capability of the cell walls to keep higher pressure inside of the cell- The protoplasam (nucleus and cytoplasm) also absorbs some compounds that characteristically increase internal pressure. Cell division then takes place and cell walls are reinforced. What is more, the product regulates all available nutrients in the surrounding environment without changes to its own role. INCREASED YIELDS AND REDUCED VEGETATIVE PERIOD. The product increases plant yields between 30% and 40% and reduces the vegetative period up to 33%. REDUCED PRODUCTION COSTS. Application of the product is a simple process requiring little management expertise. In combination with its other properties it dramatically reduces production costs and increases profitability. NO RISIDUAL SALTS. Unlike solid fertilizers which leave large amounts of residual matter in the growing media (both soil and soil-less media) the contents of the product are completely dissolved and taken up by plants.